We highly recommend using Ultra Clean spray for cleaning your stainless steel products to ensure long-lasting perfection. Ideal for removing heavy dirt and rust stains. Ultra Clean is not only the perfect choice for refined steel surfaces - but it will help to rebuild and strengthen the passive layer of your product. Care and Maintenance - How to remove blemishes and scratches on stainless steel. 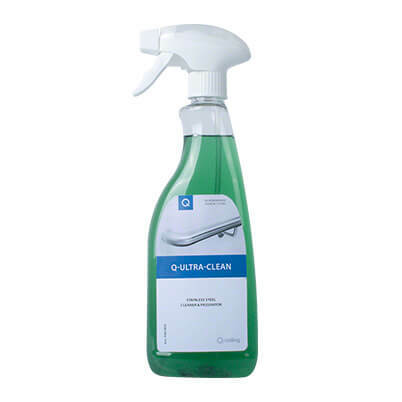 Q-Cleaner - Stainless steel protection spray. Scotch-Brite Hand Pads - For finishing and cleaning.